Created by Dexter Holland, lead singer of the famous punk rock band The Offspring, Gringo Bandito Hot Sauce is one of our most popular sauces we offer here at Chilly Chiles. There’s no doubt in my mind as to why. 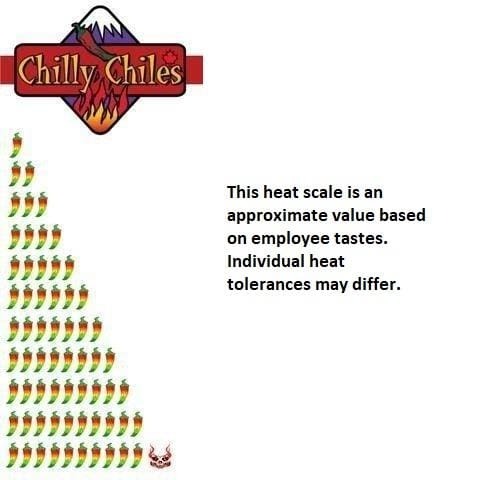 This is simply because this is a magnificent sauce which combines an intense and unique Tex-Mex flavour with a medium heat level. The mix of fresh chiles, assorted spices, and mojo sauce makes for a boldly flavoured, savoury, and highly versatile hot sauce. Even though the taste will more than likely make you instantly think of Mexican or Tex-Mex cuisine, you will soon realize that this sauce is much more than a topping for your tacos. This is a must-have in your fridge if you simply enjoy spices and fresh, tantalizing heat! In this product lineup there is also Gringo Bandito Green Hot Sauce, a 10z format of the original red sauce, and a Super Hot Sauce made with scorpion chiles! With its smooth texture, well-rounded flavour, and milder kick, this sauce is irresistible. The vinegar provides that subtle tang and pungency while the habaneros, jalapenos, and Red Japanese chile peppers provide that medium level heat. Two out of these three chiles are found very often in Mexican cuisine and thus are a perfect fit for the sauce, given the combination of spices. The Mojo, a sauce which is typically made from a combination of peppers, spices, olive oil, and garlic, combined with the spices, brings that full-bodied and bold taste. In terms of heat I give this sauce a 2 out of 10. It can be enjoyed by pretty much anyone! For those just getting into hot sauce, this is a great choice. This sauce can be used in so many ways. It’s great on eggs, burgers, burritos, tacos, fajitas, enchiladas, pizza, in chilis, sandwiches, and so much more. Add this sauce to a chicken, beef, or pork marinade. Use it when slow cooking meats and even fish! Each time I get my friends to try this hot sauce they instantly fall in love with it. I always keep a bottle of Gringo Bandito in my fridge because it’s just so darn good. Often this is one of the first sauces we offer customers to try at our tasting table because of its moderate heat and exceptional flavour. We always have a bottle open so why not come by one of our store locations and give Gringo Bandito Hot Sauce a try!